I’m spending more time painting and so you will have to excuse the blog posts lagging behind a little. At this stage I’ve completed another landscape, again stretching the medium’s capability in various ways. As you are probably aware, I’m experimenting with Alkyd fast drying oil paint. There is a limitation which I’m investigating at the moment. Some of the colours, example Cadmium Yellow, are not available as the true colour, but as Cadmium Yellow Hue instead of Cadmium Yellow. The ‘Hue’ version is probably OK, but why not the real deal? I’ve tried using Windsor Yellow as an Alkyd replacement for Cadmium Yellow. It doesn’t have the tinting power so I’m using standard oil colour Cadmium Yellow (the mediums are compatible, if a few rules are adhered to). I would like to use all Alkyd colours and see how I get on. In the next painting I’ve used only one standard oil colour and its, guess what, Cadmium Yellow. I will acquire a tube of the Alkyd ‘Hue’ and if its OK in terms of permanence, tinting power, mix-ability with other colours etc., I’ll use it. Here is the video of this painting and I promise to post the next painting tomorrow. See you then. 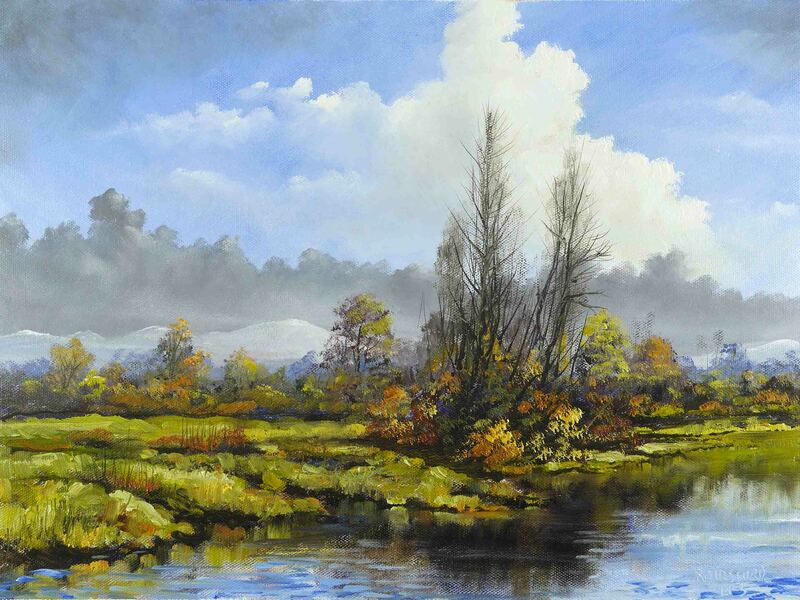 This entry was posted in Oil Painting and tagged Alkyd, April, Art, Culture, Education, green, Inspiration, Irish landscape, lake, Mountains, Oil Painting, Oil Painting Instruction, Oil Painting Landscape, painting, Pictures, Sky, Spring, Time lapse painting, Trees, Water. Bookmark the permalink. I love how the colors work together.